Despite the looks coming from the catwalk we want bigger, longer and darker lashes. Here's how to get the job done. We might be witnessing bare lashes on the catwalk but in the world I’m sure most women will agree that lashes are a big deal. I, for one, can leave the house sans foundation but you won’t catch me in public without a lick of mascara. No sir. But there’s more to Bambi-like mesmeric lashes than a perfunctory slick of the black stuff. Follow these seemingly simple steps and you’ll be amazed at the difference. Most make-up artists won’t even think of touching the mascara wand without curling the lashes first. Straight lashes can look shorter than they actually are which is something that many Asian women struggle with. My favourite lash curler has to be Shu Uemura Eyelash Curler, £20. It gives a natural curve to the lashes without leaving a kink in the hair, it doesn’t pinch your skin and the curl lasts. You can always opt for a slight more long-lasting solution. Blink Ultimate Lash Curl, £50, lasts up to six weeks. If you’re naturally fair – red heads and blondes, I’m talking to you – then the tips of your lashes are likely to be very light which can make them look a hell of a lot shorter than they actually are. Getting your lashes tinted makes a hugedifference. I get mine dyed at Shavata (Eyelash Tint, £19). Make sure that your beautician does a patch test at least 24-hours before your first tinting session – if you’re going to react to the formula you really don’t want that happening around your eyes. It might be tempting to go for jet black – which does look great – but allow your therapist to mix up a shade that will enhance the colour of your eyes. I have blue eyes when I’m at Shavata they mix in a touch of inky blue into the black; the effect is very subtle but enough to make the whites of my eyes look clearer and brighter, and my irises really pop. STEP 3. Longer equals Better. Fact. Well in my book at least. In fact I would go as far to say that your lashes are only ever long enough when you can feel them fluttering in the breeze. I have been using My Lash for the last three years and it has completely transformed my lashes. They’re longer, thicker and darker. True story. It’s technically a controlled drug (originally deployed as a medication for glaucoma sufferers) which is why it’s administered by a doctor – in this case Dr. Tom Walker – who will ensure that it’s suitable for you. I apply a drop of the solution along my lash line every morning before I pop on my mascara. It contains an ingredient that is clinically proven to extend the lash’s growth cycle. Naturally – as hair takes its sweet time to grow – it can take a little while for the results to make themselves known. For me, I saw a huge difference after about two and a half months, and that’s when the compliments starting pouring in. It’s a little miracle. Just like the hair on your head, for your lashes to look like they could be cast in a Disney movie (isn’t that our ultimate lash goal?) then you’ll need to keep the hairs there in tip-top condition too. Some make-up removers are drying. Opt for a formula that’s gentle on your lashes and conditioning at the same time. Try Talika Lash Conditioning Cleanser, £18. It has a gel-like formula which is gentle on the skin surrounding the eyes plus it contains Cornflower extract to soothe and silk proteins to hydrate the hairs. It will even get rid of rock-hard waterproof mascara. Get on it. Everything up until now has been about laying the foundations for great lashes. The true transformation however comes in a bottle of mascara. Mascara’s are not all made equal and they’ll deliver varying results – volumising, lengthening, definition – depending on what you’re after. I’m all about massive, glossy, plump lashes that obscure your vision (if I can see them out of the corner of my eyes I know I have enough mascara on). In my opinion, you can’t beat Max Factor mascaras, in particular Masterpiece Max Mascara, £9.99. A few coats delivers dramatic, high impact lashes but it’s layerable so you can be precise about just how much volume you get. Unlike a million other mascara’s I have tried, this formula doesn’t migrate down onto the tops of my cheekbones, or flake off, by the end of the day. You’ll be hard-pushed to find anything better. 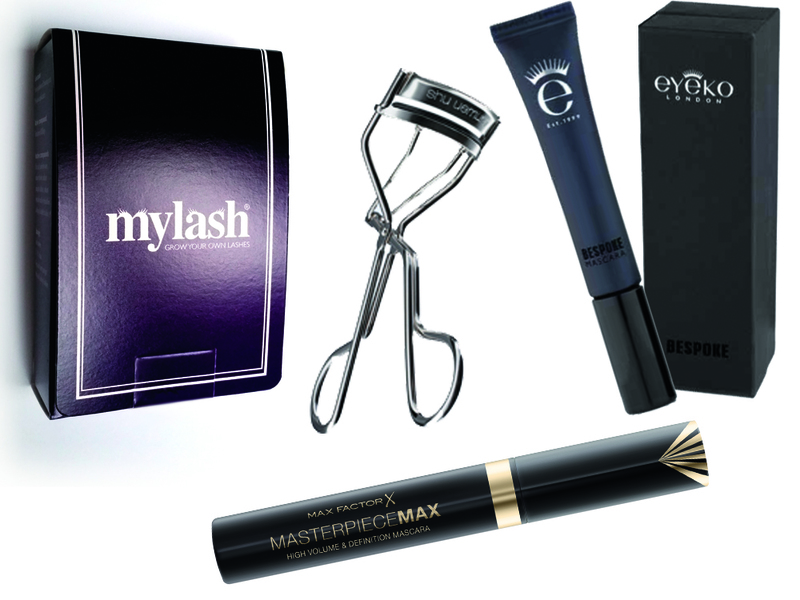 For something tailored try the new Eyeko Bespoke Mascara, £28. After a consultation a custom-made formula is whipped up on the spot and your lashes are matched to their perfect brush. For the time being the service is only available at Harvey Nichols in London.